Enter Dillan Sloan. Selena has seen the new guy in a different dream, and he is even more droolworthy in person. Beyond the piercing blue eyes and tousled dark hair, there is something else that draws her to him. Something…electric. Unfortunately, Dillan makes it more than clear that he does not feel the same. They just met, so why would he act like he hates her? Seeing yourself die is never a good thing, even if it’s just in dreams. Unfortunately for Selena, her dreams always came true eventually, so it’s just a matter of time before she bit the dust. Enter Dillan Sloan. The anti social gorgeous boy who seems to be interested, yet not quite, in her; whose very touch literally electrifies her being. Surrounded by her two best friends Kyle and Penny, Selena navigates high school and her ex boyfriend quite well. Then she and Dillan get thrown together for an overnighter at Kyle’s where she is attacked by puppets (dead people under a Maestro’s control). Dillan rescues Selena and afterwards finally shows how he really feels. But Dillan is complicated. He is part of the Illumenari, an elite group whose sole purpose is to protect humans from supernaturals. He then finds out that Selena is actually from an old Illumenari family as well, though they chose to raise her as an ordinary girl with no training whatsoever and is now brimming with untapped power. All he knows for sure is that she is now the target of the evil Maestro, and he needs to protect her at all cost. Creative. That’s how I can best describe (proudly) Pinay author Kate Evangelista. I have never before put the words maestro, undead, manticore, seer in one sentence but here it is. They are all in this mystical world Kate created. 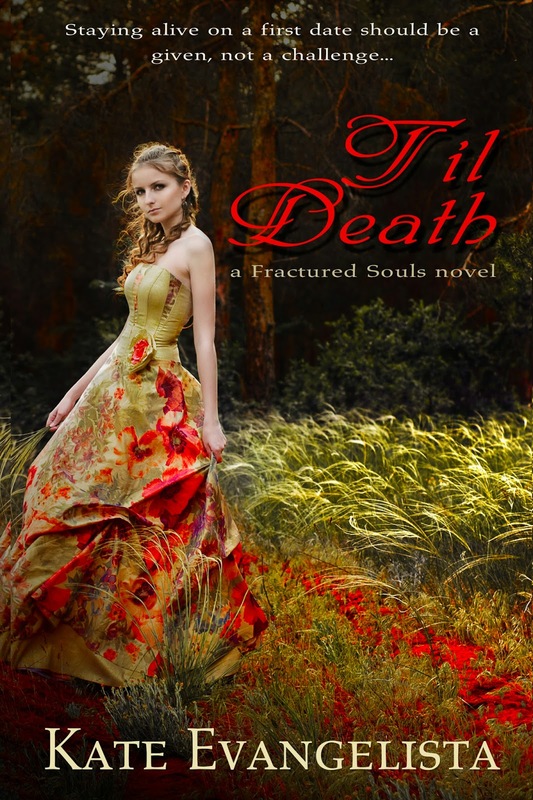 Til Death is a Young Adult novel, so sweet nothings, high school angst and dramas are expected. But beyond that there is that all important relationship with family. Selena has a close relationship with her grandparents as they’ve raised her since her parents died and I like how they try to protect her, though obviously with her growing power, something will ultimately give…and it does. Dillan is difficult to peg. I don’t know if I like him or not. He is good in all the ways that matter, but I like Kyle more. There is more mystery and intrigue with him. Half the time I don’t know if he’s genuinely concerned about Selena or just pretending to be her best friend. But they do go a long way back so I’m giving him the benefit of doubt. Though if he decides to play with the bad guys in the next book I wouldn’t be too surprised. Penny is the quintessential strong, brave and chatty best friend one can never do without. She is a good equalizer for the triumvirate. All things considered, this is a book worth picking up. If you like paranormal romance that’s sweet with a big bad BITE, read Til Death. 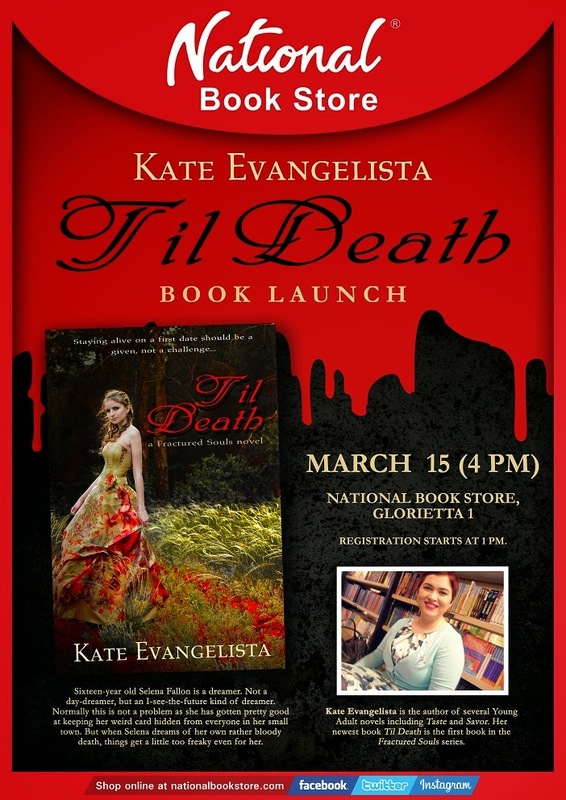 Watch out for Kate Evangelista’s book launch on March 15, 2014, 4pm at the National Book Store Glorietta 1 branch. Other books by Kate are: Taste, Savor, Reaping Me Softly, Unreap My Heart and Romancing The Bookworm.